When looking back at what has defined the UFC scene in 2017, the overriding narrative is revealment. Indeed, this was 12 months in which WME-IMG made their mark. The turn of the year was hallmarked by continuity as the new owners looked to deliver the same product which reached new and dizzying heights in 2016. President Dana White remained at the forefront while the look and feel of the business made for a fan experience no different to the previous regime. Weight classes have been blurred, rankings ignored and the WME-IMG ownership has encouraged a culture of feast or famine. Loaded pay-per-view cards have contrasted drained FOX events and the natural decline from 2016, whether by mitigating circumstances or ownership ethos, has created a climate of transition. But for all the change outside the Octagon, the one constant has been inside it with plenty of action and drama served up. With that in mind it’s time to look back at 2017 and dish out our UFC awards, and remember, discussion is always welcome. This year the UFC has suffered a shortage of stars with a Conor McGregor-shaped hole making a large dent. 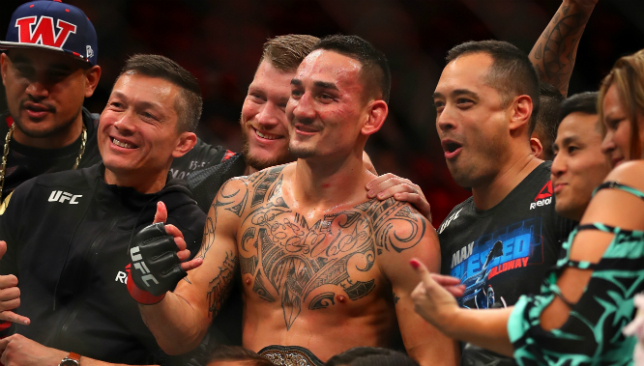 However, without active figures at the highest level, the door was opened for the next generation and one man to walk on through was Max Holloway. At 26, the featherweight champion is leading a youthful charge which sees middleweight title holder Robert Whittaker (27) and women’s strawweight queen Rose Namajunas (25) dovetail a new era for MMA. But the Hawaiian is the standout. From contender to champion to pound-forpound consideration, Holloway has owned this year. Two mirrored victories over the 145lbs great Jose Aldo, once in Brazil and then in Detroit, provided the year’s most emphatic statement. He extended his deeply impressive win streak to 12 victories and the bulldozing of Aldo has paved way for the “Blessed Era”. Our 2016 Young Fighter has matured into an unstoppable force and one who will take some shifting in 2018. The criteria for young fighter will differ from author to author but for this review the award is handed out to the man or woman on the cusp of a major breakthrough. And with that context there is a clear winner – Darren Till. The UFC is a star-driven business which is why the promotion has gone out of its way to invest in new stars. Talent is simmering under the surface in practically every division but Till has already exploded onto the scene and injected new life into the welterweight division. Three fights and three wins in 2017 but of course his most impressive arrived in October when he demolished the ever-present title contender Donald Cerrone. A heavy underdog, the Liverpudlian produced a virtuoso striking performance to earn a first-round finish and his witty skills on the mic have drawn comparisons to a certain Irishman. A fascinating 2018 awaits with the prospect of a title shot on the horizon. A five-round fight in name only, Justin Gaethje’s much-anticipated UFC debut was never likely going to require the full quota. But three reckless frames of leather traded action made this a fight of the year. The various elements of MMA, from wrestling to boxing, to Muay Thai and BJJ means appreciation comes in many forms but collectively we can all agree few things beat a good slugfest. There is room for technique, strategy and gameplanning but a back-and-forth war entertains like no other. Gaethje arrived from WSOF with a reputation for drowning his opponents into the deep water but the question was always whether he could replicate that violence against the best in the world. 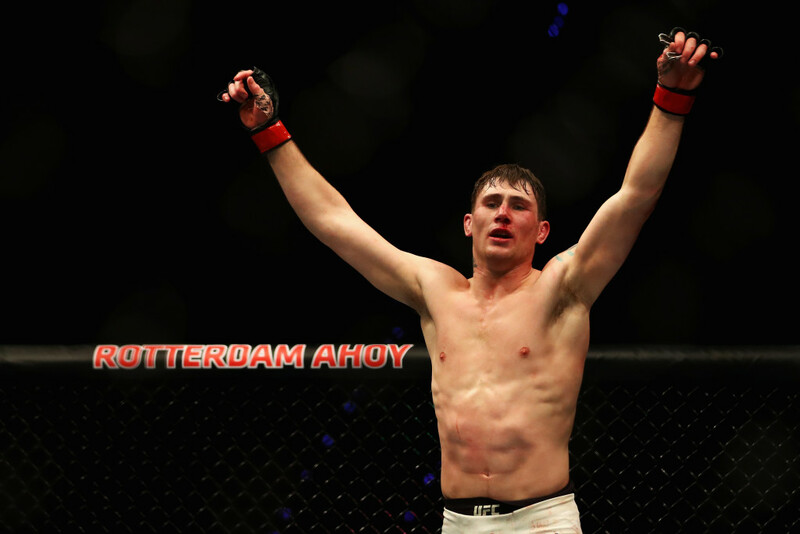 Johnson as a top-10 lightweight provided the perfect debut bout, but he looked to spoil the party when Gaethje was dropped only for the newcomer to rally and record victory in remarkable fashion. Both fighters were prepared to go out on their shield with the marriage of brutality and blood making for a thrilling spectacle. Mirsad Bektic was the next generation’s golden boy. A champion in waiting and blue-chip prospect, the 26-year-old had racked up an 11-0 record and entered UFC 209 with the expectation of rolling over Darren Elkins. And in round one he justified the hype, tagging Elkins clean and bloodying up the Team Alpha Male fighter with right hands. A nasty cut above Elkins’ eye required doctor’s attention in between rounds and the Bosnian smelt blood, although it was hard not too given the sheer amount spilt. The beginning of round two saw the trend continue but at the midway point Elkins found success on the ground as he maneuvered into advantageous positions. But round three is where this fight sealed cult status. Again Elkins ate clean shots with his sole success via the ground exchanges and his work there saw Bektic fade fast. A stunning comeback was completed with two rights hands and a kick to the face and while the collision inflicted car-crash damage, it’s one which retains legendary acclaim. There’s just something special about New York and three title fights. Last year UFC 205 delivered history with Conor McGregor rising to become the promotion’s first concurrent two-weight world champion, while Tyron Woodley and Stephen Thompson’s insane back-and-forth war sandwiched Joanna Jedrzejczyk’s vintage victory over Karolina Kowalkiewicz. This year three belts headed the return to Madison Square Garden and all three changed hands in dramatic fashion. But there was highlight reel action prior to the main card. 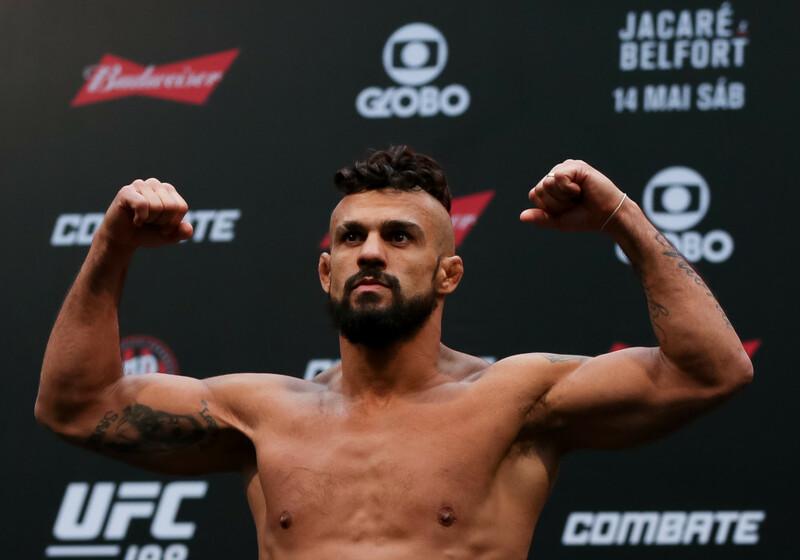 Ricardo Ramos’ cracked Aiemann Zahabi with a rare elbow knockout while bizarre endings in Curtis Blaydes vs Aleksei Oleinik and Mark Godbeer vs Walt Harris added to the drama. 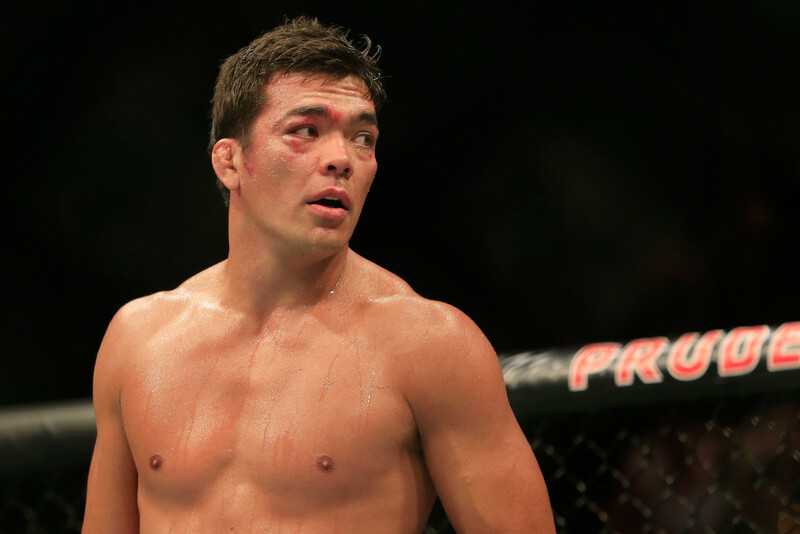 Ovince Saint Preux’s comeback headkick KO then segwayed into the main offering which saw Paulo Costa simply assault Johny Hendricks and Stephen Thompson thrash Jorge Masvidal. Rose Namajunas scored her major upset of Joanna Jedrzejczyk – more of that to come – before TJ Dillashaw settled his beef with Cody Garbrandt to retake the bantamweight belt with a glorious second-round KO. 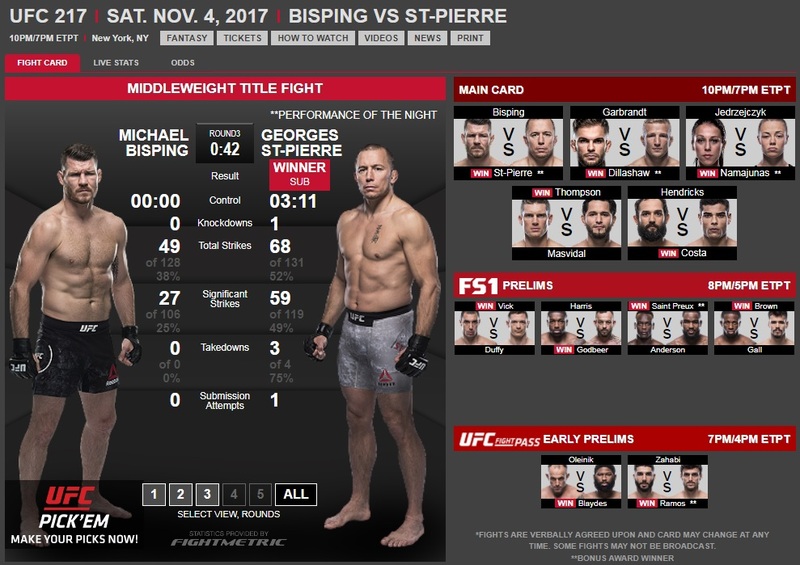 To top it all off, Georges St-Pierre became a two-weight champion with an emphatic submission of middleweight champ Michael Bisping and his triumphant return was the icing on this three-tiered cake. Maybe the victory itself shouldn’t have been a surprise but the manner of it certainly shook up the world. For Rose Namajunas to beat the best female fighter in the world, it was widely agreed her skills on the ground would provide the avenue to an upset win. No one predicted she would beat Jedrzejczyk with her own strengths. She knocked the Pole out with a ferocious first-round pummelling to claim the women’s strawweight strap and the finish arrived after knocking the champ down twice. It was clean and clinical. Regardless of gender, Jedrzejczyk had a worthy claim to the title of MMA’s most skilled striker and her histrionics in the build-up in contrast to Namajunas’ stoicism had many considering a record-equalling sixth successful title defence. But Namajunas tuned out the noise to turn up the UFC 217 crowd with her upset of the year. Not just the submission of 2017, but arguably the best ever by the best to do it. A once-in-a-generation fighter, ‘Mighty Mouse’ surpassed Anderson Silva’s consecutive title defence record with an astonishing finish. 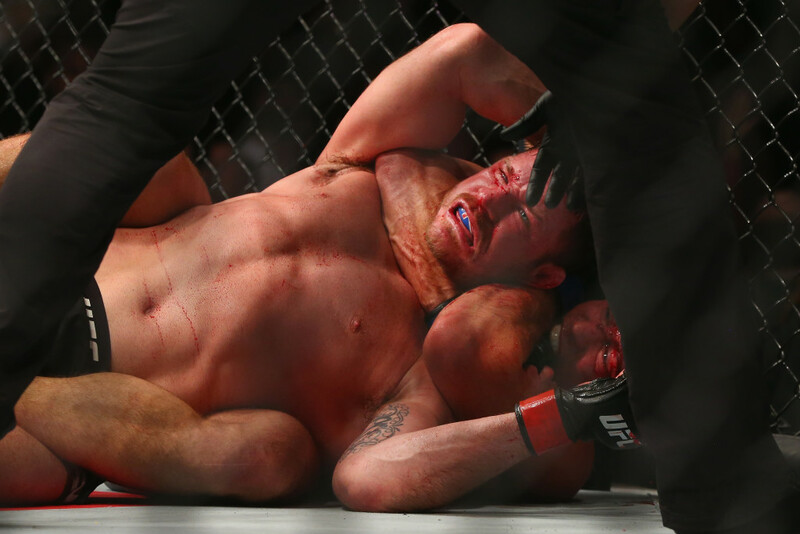 Granted, Borg was overmatched but he is a beast on the ground and Johnson’s modified belly-to-back suplex into a flying armbar submission is as unfathomable as it is innovative. The finishing sequence began with the flyweight champion’s arms wrapped around Borg from behind and near the cage. When the challenger’s weight shifted, Johnson threw him up, then seamlessly landed the armbar. Never has the finish been seen before in the Octagon and the combination of history and the nature of the submission makes it an obvious winner. 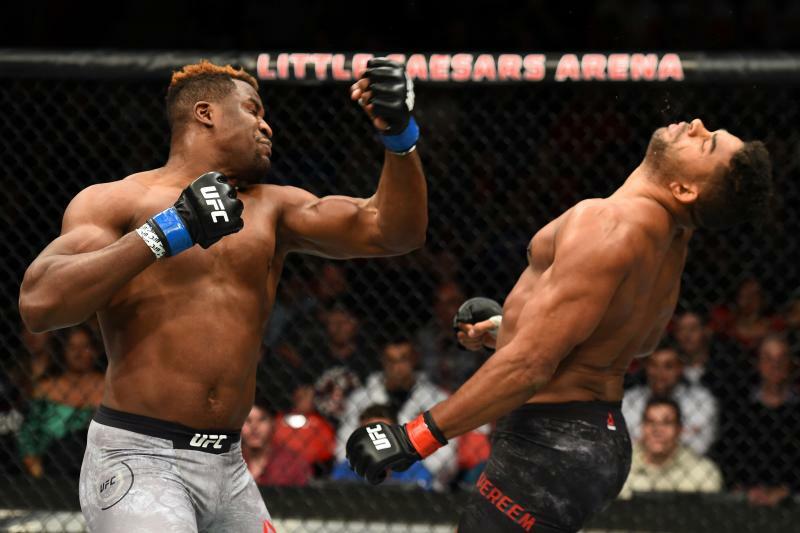 Francis Ngannou didn’t knock Alistair Overeem out – he damn near decapitated him. The year has witnessed a fair share of KOs ranging from practically ever range of the richter scale. Not one, though, produced the magnitude of Ngannou’s strike. Indeed, there’s an argument it’s the most spectacular knockout ever delivered via a punch and it genuinely had viewers fearing Overeem’s wellbeing. It’s been a long time since a knockout produced that sort of concern but the force behind the left-hook was frightening. The wind-up was summoned from the depths of the earth and the connection on Overeem’s chin practically sent the Dutchman into orbit. His head snapped back and his body collapsed to the canvas with Ngannou earning a shot at the division’s champ Stipe Miocic at UFC 220 next month as a result of the first-round win. Starved of star power, the beginning of 2017 for the UFC was a complete contrast to the craziest, most unpredictable and most important year in the history of the promotion in 2016. 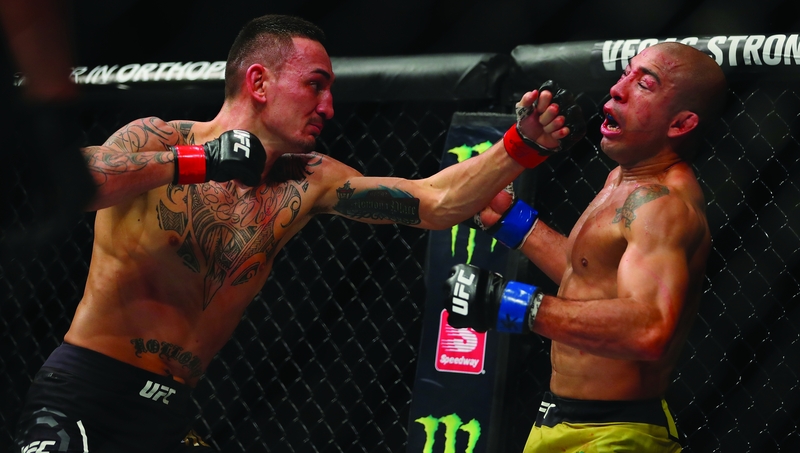 But after a cold start, the year is ending in red-hot fashion as UFC 218 followed on from the thrilling events of 217 and 216 in providing emphatic knockouts and back-and-forth brawls. Topped out by Max Holloway becoming the first man to beat Jose Aldo twice to retain his featherweight title, a myriad of narratives helped to shape one of the cards of 2017. Here, we look at the four things we learned as the UFC saved some of the best for Detroit. Perhaps it’s because the spectre of Conor McGregor lingers over the 145lbs division but the promotional push for Holloway has been short of thrust. When you consider the depth of marketing the UFC has invested in the likes of Sage Northcutt, Paige VanZant and Cody Garbrandt, you can’t help but feel Holloway has been left shortchanged. His performance on Saturday not only provided justification for more of the spotlight, but also why the 25-year-old deserves to spearhead the new generation. Indeed, the ‘Blessed Era’ leads the new era. Robert Whittaker (26), Kelvin Gastelum (26) and Rose Namajunas (25) are all exceptional young fighters creating waves. But Holloway stands apart with his livewire fighting style married to an ebullient personality which deserves a superstar promotional push. Riding a 12-fight win streak, he now owns consecutive beatings over Aldo and is a certain contender for Fighter of the Year. The Hawaiian is only getting better, too, with the claim of division’s best ever surely not far away. Holloway’s win over Aldo strengthened his claim to be the division’s best. Francis Ngannou launched Alistair Overeem into the air and in the process gave his own title ambitions lift off. 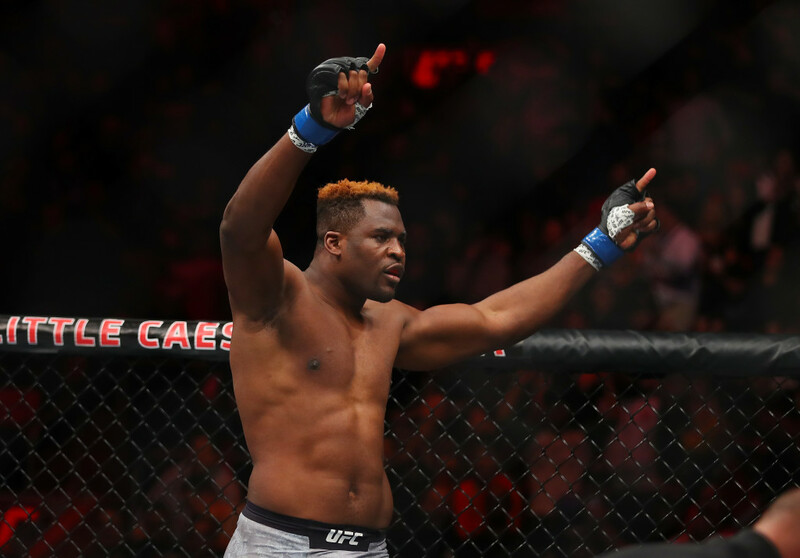 The 31-year-old Cameroonian slept Overeem with a violent left hand and his presence in the division has awoken the UFC’s land of giants. defied physics to remain on his shoulders. With six straight stoppages, Ngannou is hurtling towards champ Stipe Miocic with a speed only matched by that of his hype train. It was the kind of scorching performance which means only the title fight makes sense and it will surely be one of the most anticipated clashes of 2018. Miocic has more tools than other fighters in the division, but if a shot like the one which froze Overeem in time lands, there’s simply nothing he can do. If Ngannou can’t be stopped, he might be the only man no-one will want a title shot from. After the devastation of defeat to McGregor was followed by the controversy of a ‘no contest’ with Dustin Poirier, Eddie Alvarez was fast losing relevance at the top of 155lbs. 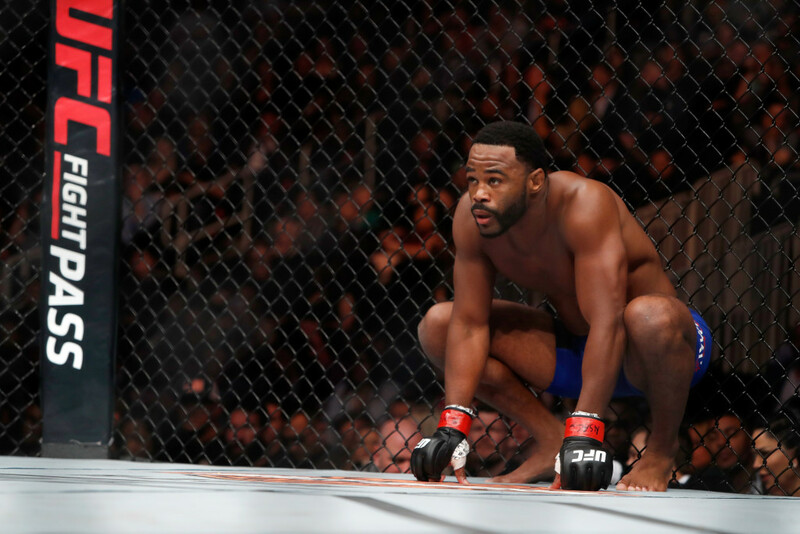 But the ‘Underground King’ responded emphatically with one of the performances of the year to stop Justin Gaethje. The whirlwind clash was a welcome deviation from fights which promise so much but in the end delivered little. In reality, with their forward-pressure style, a war was only ever going to be the outcome and they didn’t disappoint. Gaethje’s brutal leg kicks hallmarked the early stanzas, but the former champ’s work to the body gradually wore his man down. Battered, bruised and bloodied, the pair entered the third session in bits but Alvarez summoned the energy to banish ghosts of past to land a huge knee of the chin of Gaethje for the stoppage. Now, Alvarez will surely cast his eye to the year’s ending clash between top contenders Khabib Nurmagomedov and Edson Barboza. Eddie Alvarez bounced back to show he’s still a contender. Insanity is perhaps the only word fitting to describe Yancy Medeiros’ win over Alex Oliveira on the prelims. 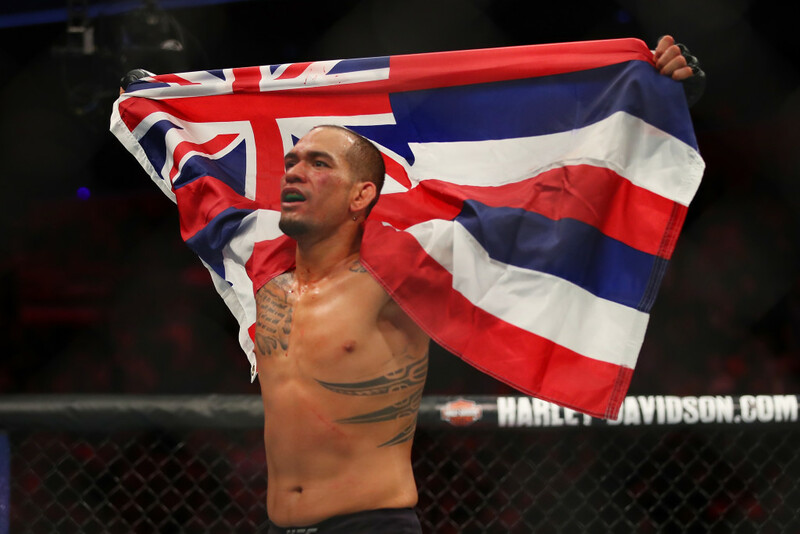 With a comeback to rival Darren Elkins’ bonkers bout with Mirsad Bektic, a first round which is a contender for the best of the year and a fight which overall delivered pure savagery, Medeiros came out on top with a third-round stoppage. 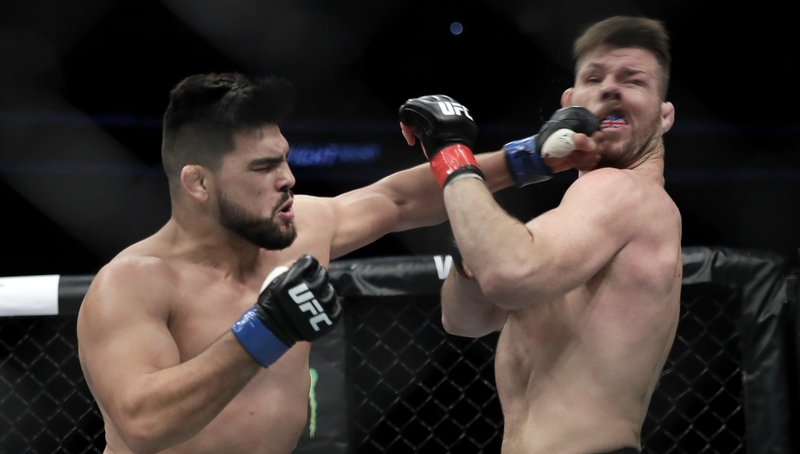 It was beautiful brutality, the Hawaiian surviving two knockdowns in the opening round and yet still managing to bust the Brazilian’s nose open. In the end, Medeiros’ measured approach countered Oliveira’s all-impact style. A Fight of the Year contender even before Alvarez and Gaethje stepped foot in the Octagon. 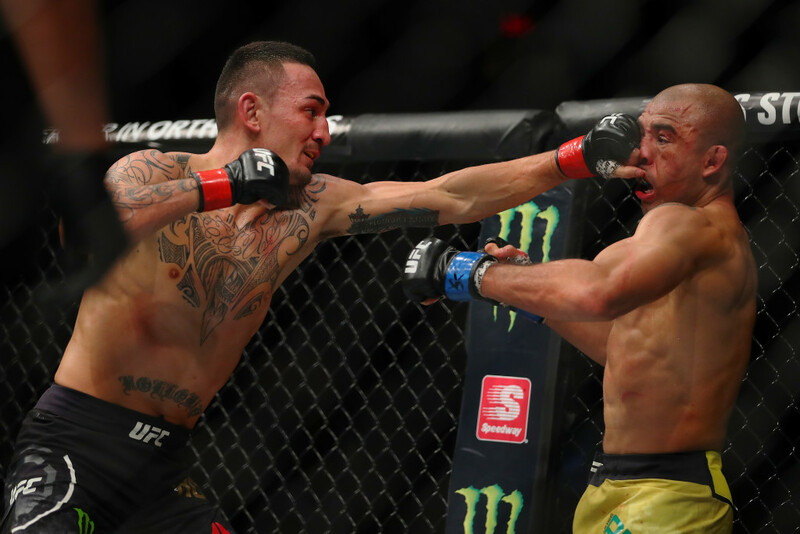 Medeiros’ win over Oliveira was a Fight of the Year contender.